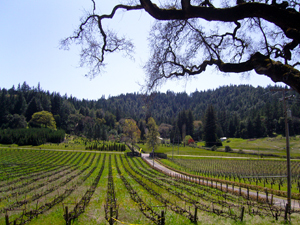 After moving to Sonoma County about a month ago now, I decided it was time to explore further and headed north and the drive to Mendocino to take in the sights and a few wines in Anderson Valley. The beautiful spring day encouraged me and I found the long drive very pleasant and inspiring as I flashed by green hills, rolling vineyard landscapes, redwood groves, rock strewn meadows, babbling creeks and much, much later the intensely blue Pacific Ocean, I mean this is why I live on Northern California’s rugged coast now. I had been out this way only once before, in the pouring rain and in the middle of a dark winter, so this was pure heaven, and even better was the lack of traffic as I twisted and turned my way to Boonville and Philo in the Yorkville Highlands AVA in the Anderson Valley. Finding friendly and easy going wineries with picturesque settings is not too difficult here and I recommend getting up this way, especially if you like mostly organic and cool climate wines, with Pinot Noir leading the way for reds and Chardonnay for the whites, though I always find the Gewurztraminer to my favorite from the region. This trip found me at Yorkville Cellars, in a slightly warmer area of the valley, where they do elegantly styled Bordeaux varietal wines. I enjoyed their Semillon, Cabernet Franc and a special meritage that included the original six Bordeaux grapes: Cabernet Sauvignon, Cabernet Franc, Merlot, Malbec, Petit Verdot and the rare Carmenere that is now mainly found in Chile. Yorkville Cellars offers a peaceful place to stop and the wines are solid and easy to drink, defiantly worth the stop and free tasting. Moving on down the winding road, I ended up at Londer Vineyards tasting room and was lucky to find Shirley Londer herself running the tasting bar and pouring some of the wineries finest wines. I had met the Londer’s while visiting Pisoni Vineyards many years ago, and had remembered their enthusiasm and warm nature. Londer started producing wines in 2001 with the help of ex-Flowers wine guru Greg La Follette and they have been rolling ever since with outstanding Pinot Noir, Chardonnay and the aforementioned Gewurztraminer. Shirley and Larry Londer still have a talented winemaker in Rick Davis, and were thrilled when Wine Spectator gave them the highest score they have ever given for an Anderson Valley last year for their “Corby Vineyard” Chardonnay, which got an impressive 95 Points. I must say, for me, it was the dry Gewurz that made me smile most! That said, I was very happy with the Ritchie Chard, and the stylish 2007 Pinots, the Ferrington and the Parabol, of which I rated the Parabol the highest for the potential it shows and the long silky finish. No trip to Anderson Valley or Mendocino can be done without dropping in on Navarro Vineyards, a tiny winery that normally only sells direct or at selected restaurants. Navarro does a nice selection of small production wines that are of great quality and sell them at equally great prices! 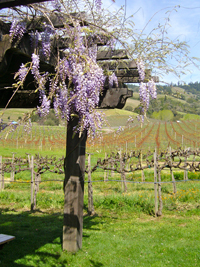 This place is beautiful with lots of charm and friendly staff, as well as a small herd of sheep to keep the weeds down near the vineyard that make for good photo ops and give small children something to take in while the grown ups taste the wines and or picnic on the scenic deck area. This time I tried a couple of wines that I hadn’t tried here before, a crisp and surprising Chenin Blanc and a bright and fresh Mourvedre that tasted like a cross between Zinfandel and Pinot Noir, and I mean that in a good way. I also enjoyed their Alsace white blend called Edelzwicker, a cuvee of Gewurztraminer, Riesling and Pinot Gris that on this warm sunny day really hit the spot, plus I had to try the famous “Methode A L’Ancienne” Pinot Noir from the 2007 vintage, another fine and elegant example of this grape. Navarro also sells some of the area’s cheeses and munchies to be sampled there or taken on the road, but I suggest carrying away as much wine as you! 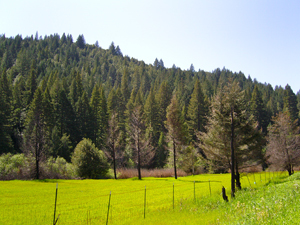 Leaving Anderson Valley and hitting the rugged Sonoma Coast takes you through old growth redwoods and amazing vistas along West 128 to Highway 1, and from there you can quickly get to Mendocino or Fort Bragg. I did a quick spin around the parts, before taking the long way home down the coast, hitting small coastal hamlets and State Parks along the way. If you’ve been to Big Sur then you’d get an idea of this stretch of coastline, though it is more varied and in some areas even more dramatic, if a bit lonely and more remote. I was blessed with a lack of RV’s and only a slight breeze to deal with as I stopped many times to marvel at the majestic and breathtaking scenes. 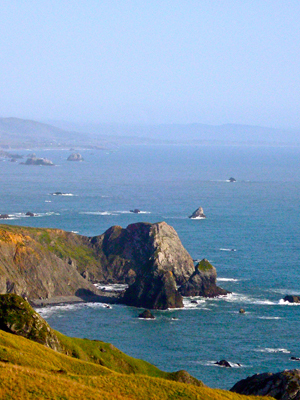 High cliffs, cypress and redwoods on steep hillsides, windswept coastal meadows, old seaside farms and ranches, some long abandoned others still in use, and rocky coast vistas that words could never due justice in describing here. I did this 250 trek in an afternoon, but it was a crime not to take a bit more time and explore the area much more in depth, and I suggest a full weekend or a week even, as there is some much to see and experience here. I can’t wait to take my someone special up this way and really share it all and soak it all in again. Breggo Cellars, Roederer Estate and Goldeneye while in Anderson Valley!